Am I the one and only in Lapis Blue ? You're a one of Steve, don't think I've even seen one before..
"Life's too short not to!!" It's going to be rare since it costs so much. Any idea why it's so expensive? No idea at at all Stevie. I only "played" with the configurator at home (as you do) to see what it would look like, and couldn't believe my luck when they said they had one in stock with all the options I wanted. Mind you £750 for flat colour is a lot of money, but it does look very different. The side stripes finish it off nicely, and I have a couple of items I need to get to complete the look I'm after. I was toying with white silver / red but I have seen a few of those around, and the other thought was BRG/red, but my wife has a BRG R56 One, and I was told "no"
When you see it in the metal it does look pretty special. It got a similar sort of depth to the Inspired by Goodwood Colours. I've got one coming in to the Centre towards the end of this month so i could see if i can get some nice photos of it done? Location : Banbridge County Down N.I. 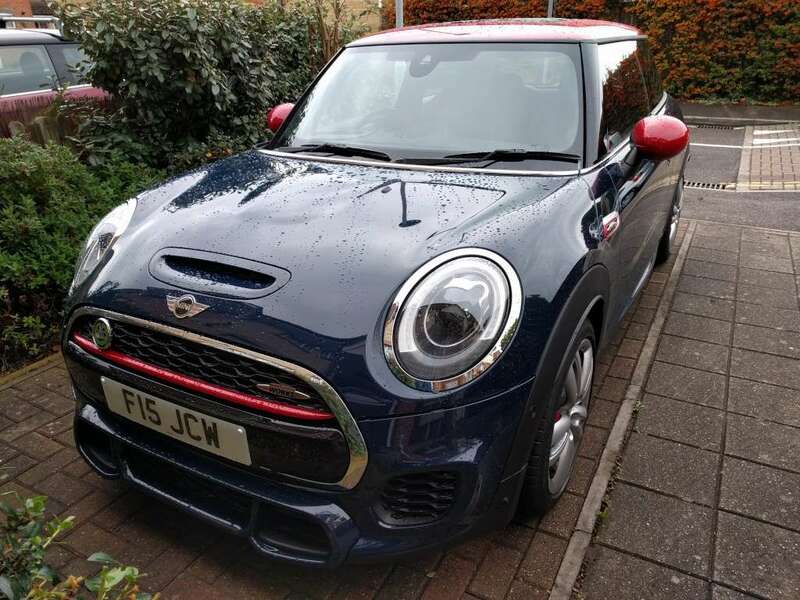 I have a Lapis Luxury Blue and Red JCW waiting to go into the showroom in my MINI Centre! Will get some pics for you guys! You're just a trend setter! It was looking rather lonely in here, so I thought I had better give you some company! And is that another MINI I spy next door? Thanks, and yep it is The neighbours use it as a bit of a workhorse though! Did you sell your other plate from the BMW? Subject: Re: Lapis Blue ?